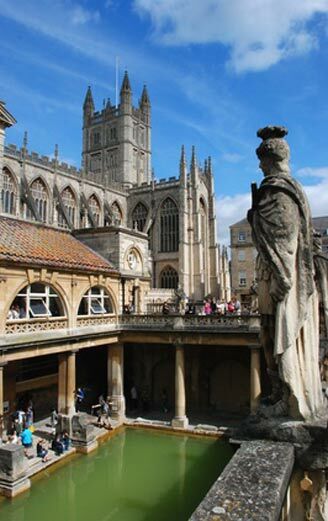 The City of Bath is an elegant town in the south west of England. A former spa town it still has a Pump Room where people take the waters and well-preserved Roman baths that are a major tourist attraction. Audio tours are available in various languages. The City of Bath welcomes thousands of visitors each year attracted by its splendid historic buildings, museums including one of costume and fashion, smart tea shops, a good shopping centre and a whole range of activities for tourists such as ghost tours and open-topped bus tours. Within an easy drive are the Stonehenge and Avebury pre-historic stone circles are a tourist draw in Wiltshire. In the same county there are horses and figures drawn in the chalk on hillsides.